If you follow me on Instagram and Twitter, you know that we recently took a trip to Los Angeles for the BCS National Championship Game. We had a fantastic time! 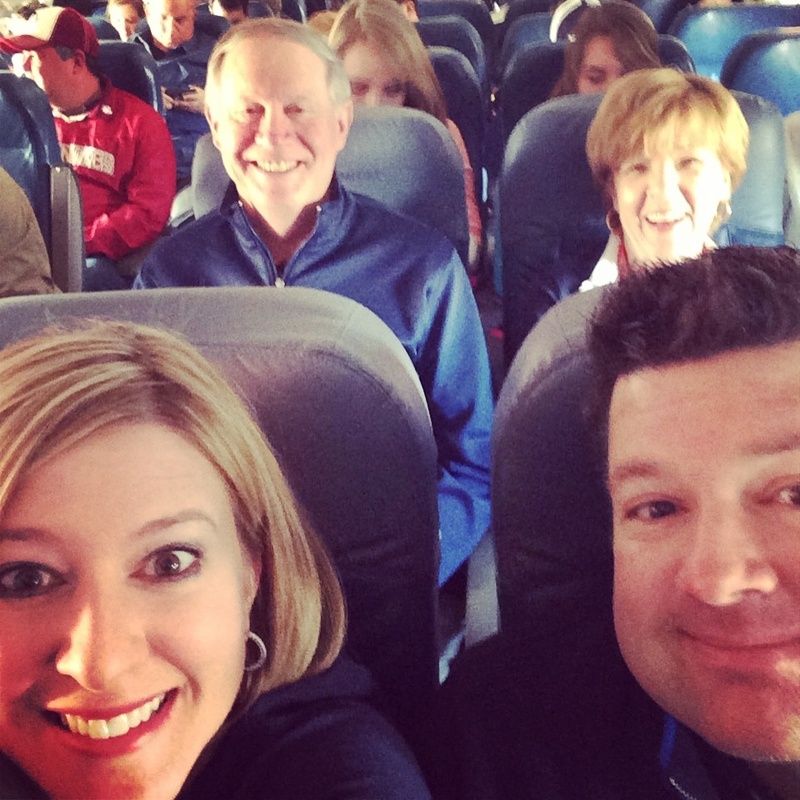 We were on the same flight out to LA with my parents (in the back of the selfie). They just happened to be seated behind us. Worked out well for the photo. 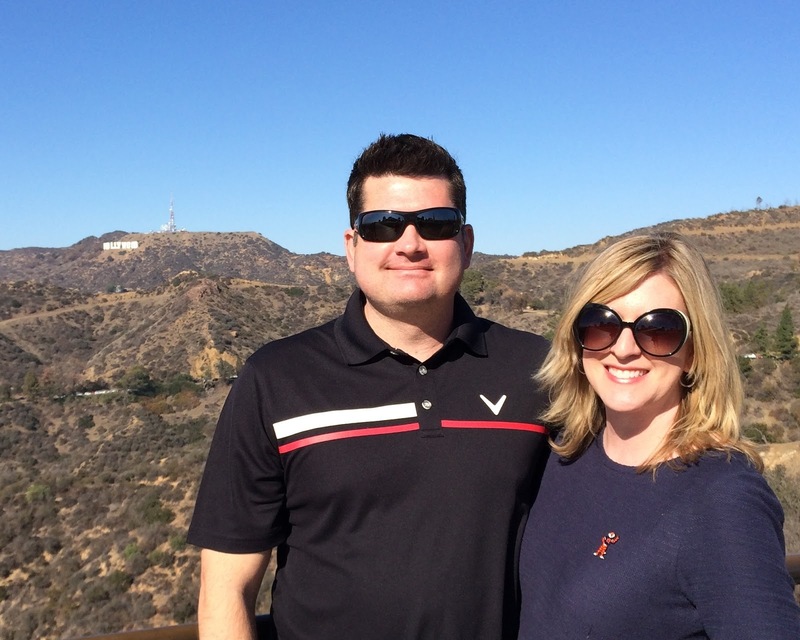 As soon as we got in the car, we headed to the Griffith Observatory. 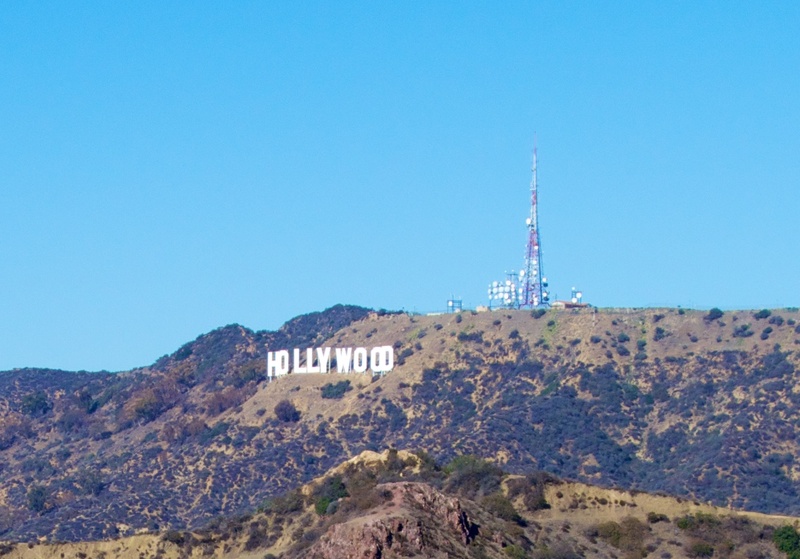 It has a great view of the Hollywood sign. 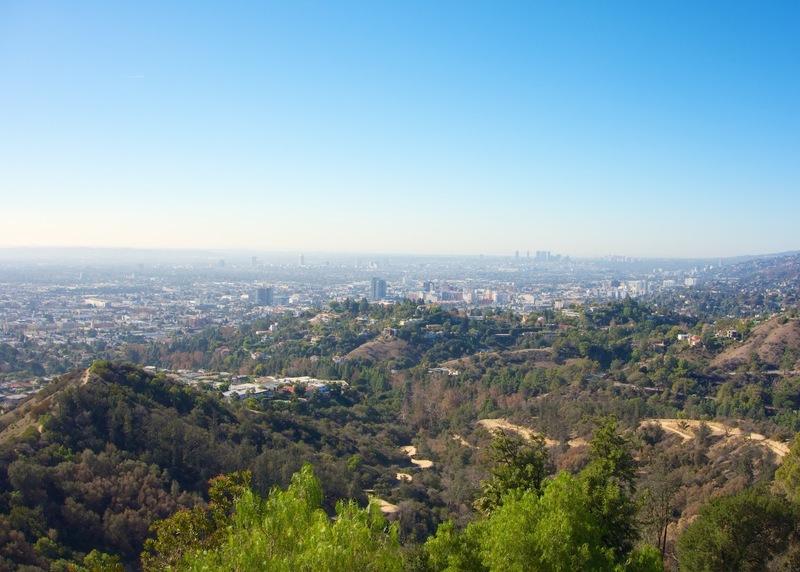 You can see all of Los Angeles from the observatory. 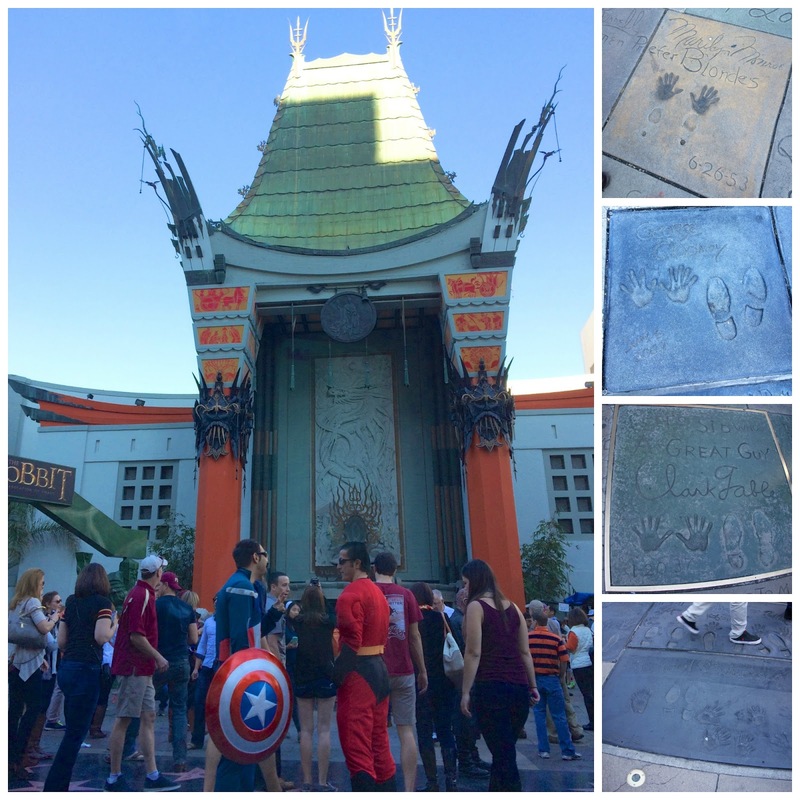 After the observatory, we went to the Chinese Theater and Hollywood Walk of Fame. The Chinese Theater was crazy. It reminded me of Times Square and The Strip in Vegas. There were lots of people dressed in character and people trying to hand you stuff. The theater was really cool. I really loved seeing all the hand and foot prints in the concrete. We saw Marilyn Monroe, Clark Gable, George Clooney & Michael Jackson (to name a few). 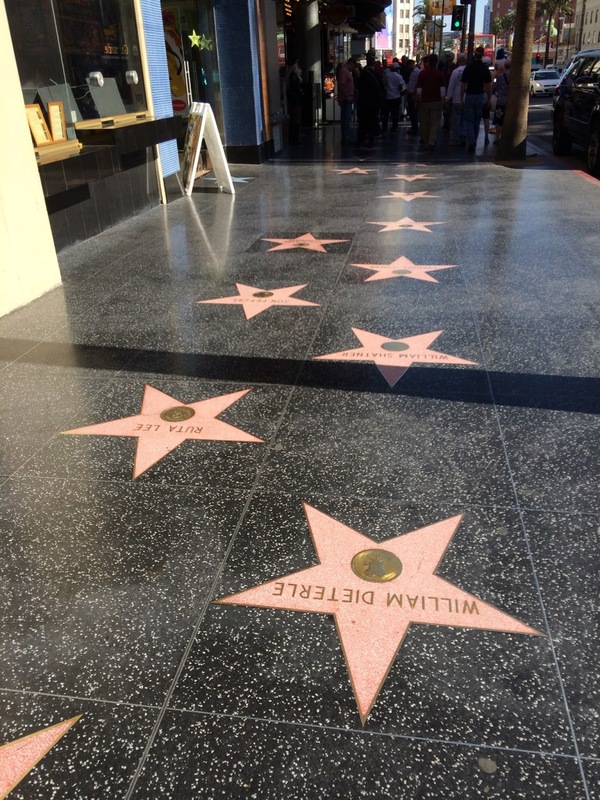 The Hollywood Walk of Fame is right there at the theater. We saw tons of stars that we recognized. It was finally lunch time! This has been on my list of places to eat for years! 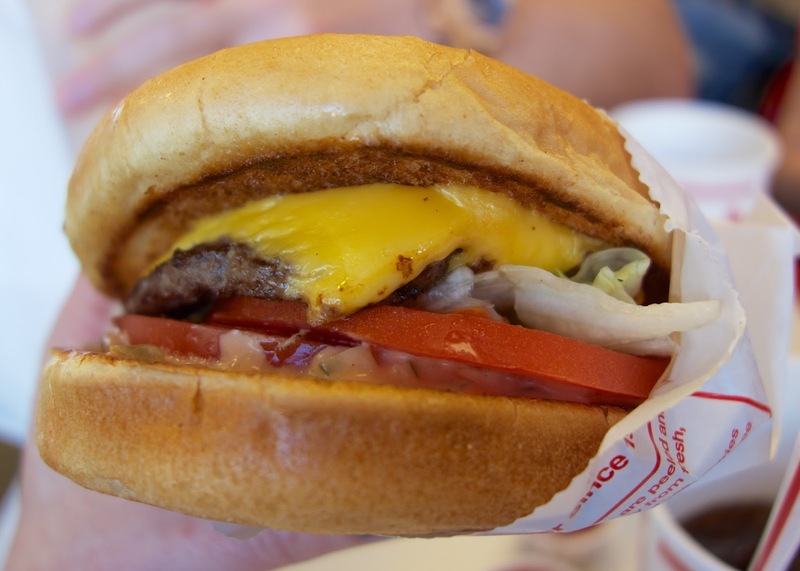 Animal Style is the only way to go! It was CRAZY, CRAZY BUSY inside. There were tons of Auburn and FSU fans in here. It probably took about 20 minutes to get our food. That turned out to be fine since we had to hawk people for a table. The burger was worth the wait. I really liked the bun. It was nice and toasty. 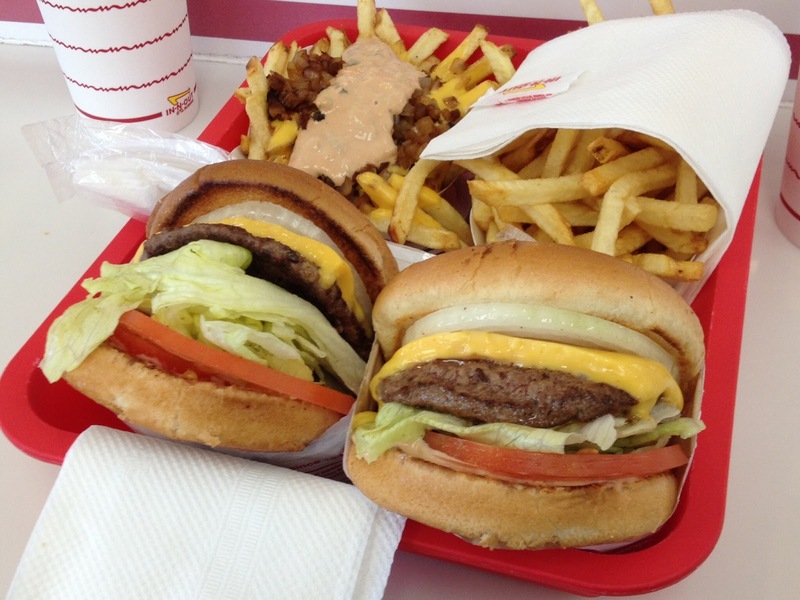 I wish we had an In-N-Out in Alabama. We had to walk off all that food, so we hit up Rodeo Drive. The shops were nice. It was smaller than I had envisioned. Very similar to shopping in Las Vegas. We had time to kill before dinner, so we drove through Beverly Hills. One thing we noticed was there were tons of new cars. It appears that everyone in Beverly Hills got a new car for Christmas. We got behind a few tour buses and saw some celebrity houses. We have no idea who lived there, but the buses stopped so we know it was somebody famous! If I ever go back, I would definitely do one the the celebrity home tours and a studio tour. 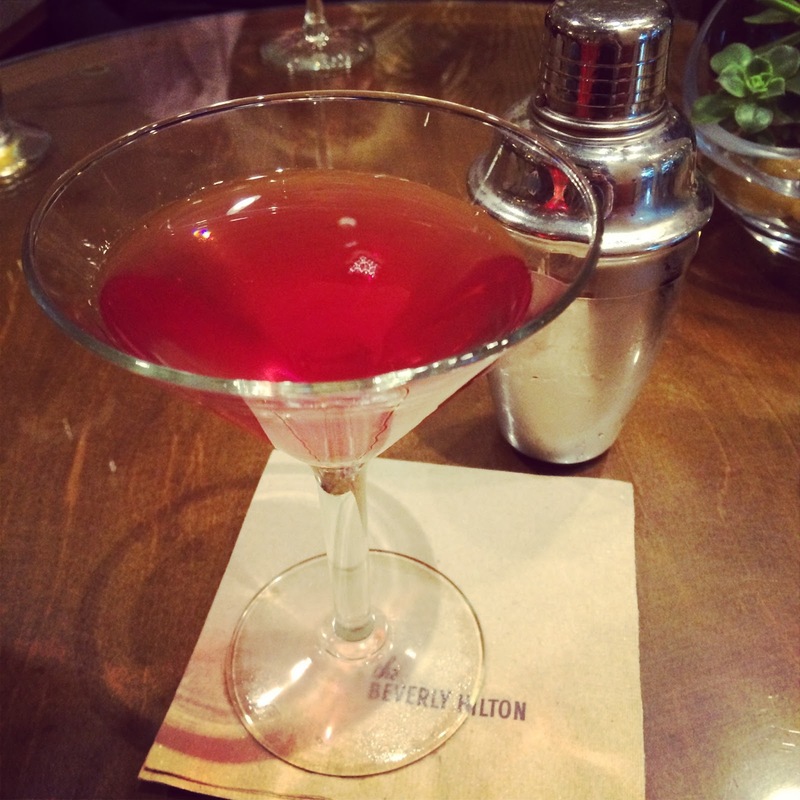 It was finally time for a drink. 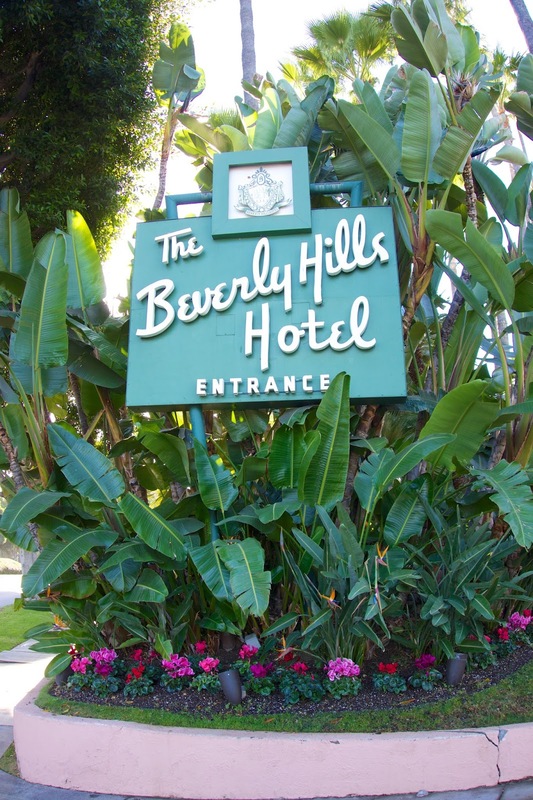 We stopped at the Beverly Hilton. It was really nice inside. It should be! They host the Golden Globes for goodness sake. I would definitely stay there if I came back to Los Angeles. 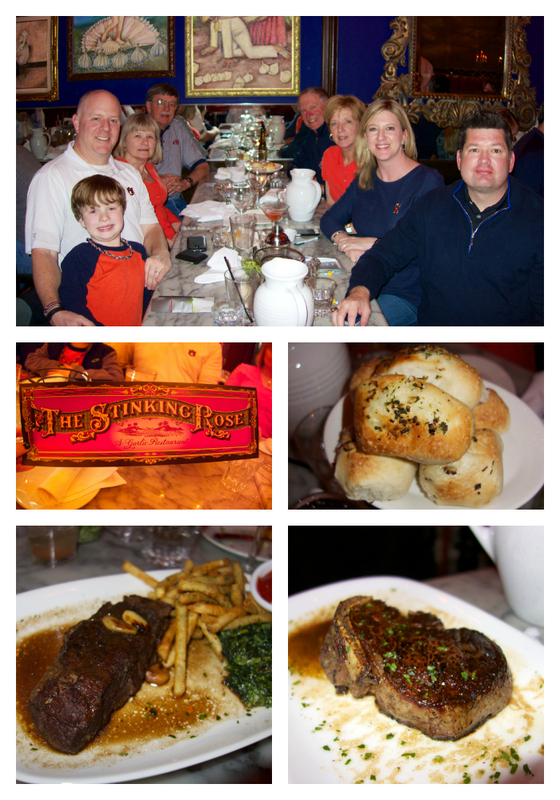 We met up with our football family for dinner at The Stinking Rose. It was good. We could go in our casual clothes, so it was really good. I loved the garlic rolls. I got the short rib (bottom left) with french fries and creamed spinach. Chicken Legs got the "Macho Cut" bone-in filet (bottom right). All the food was really good, but the company was even better! The next day was game day. 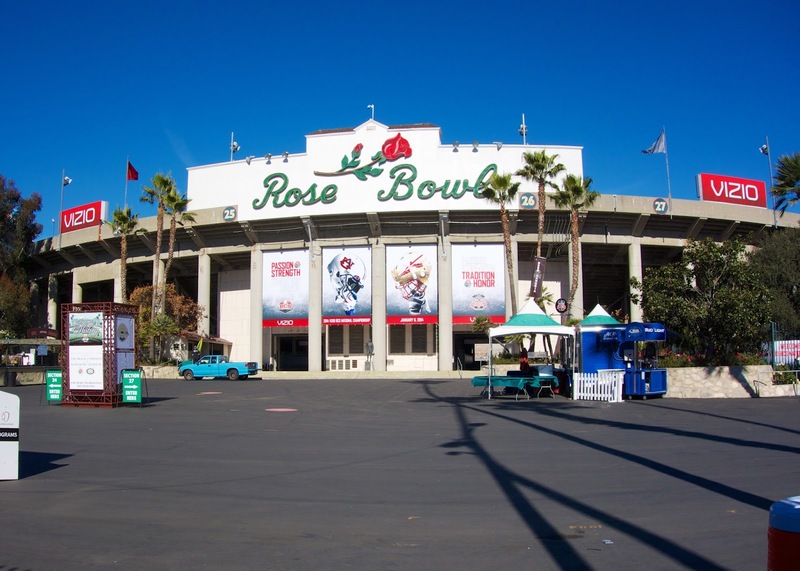 The Rose Bowl is awesome. 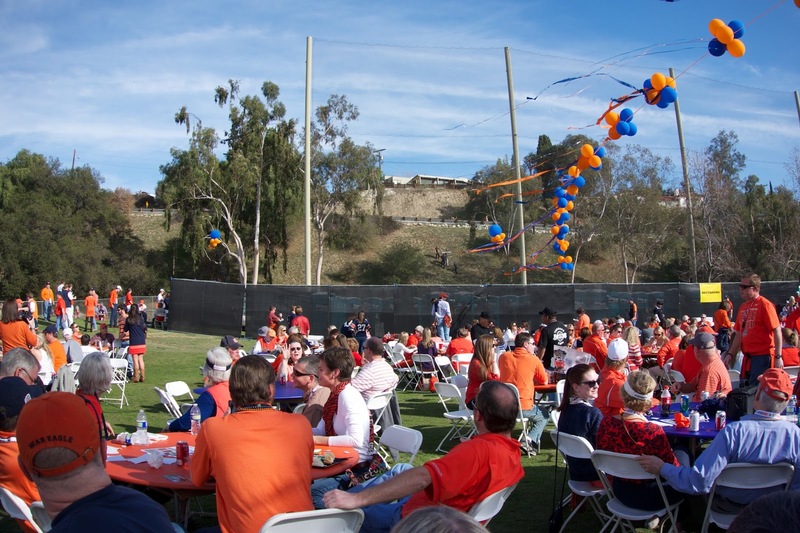 I know why they call it "The Grandaddy of Them All" - great venue. 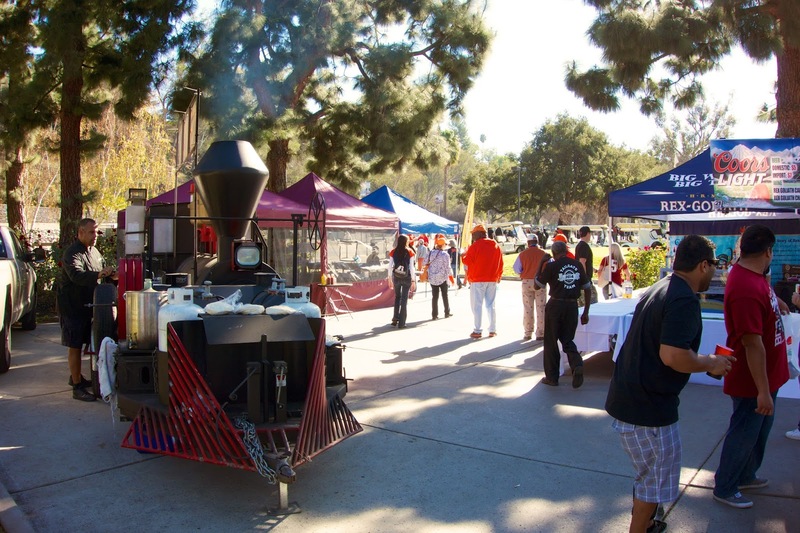 The Rose Bowl had lots of food and drink vendors/food trucks all around the backside of the stadium. 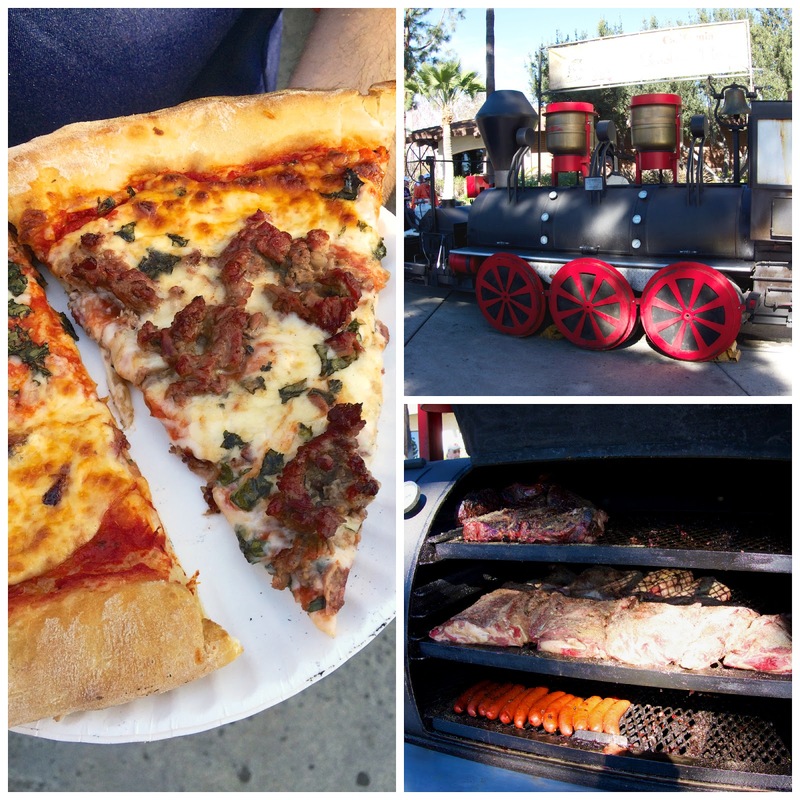 We couldn't resist the Tri-Tip Pizza from P-Train's California BBQ. The BBQ grill was in the shape of a train and they would blow the whistle periodically. 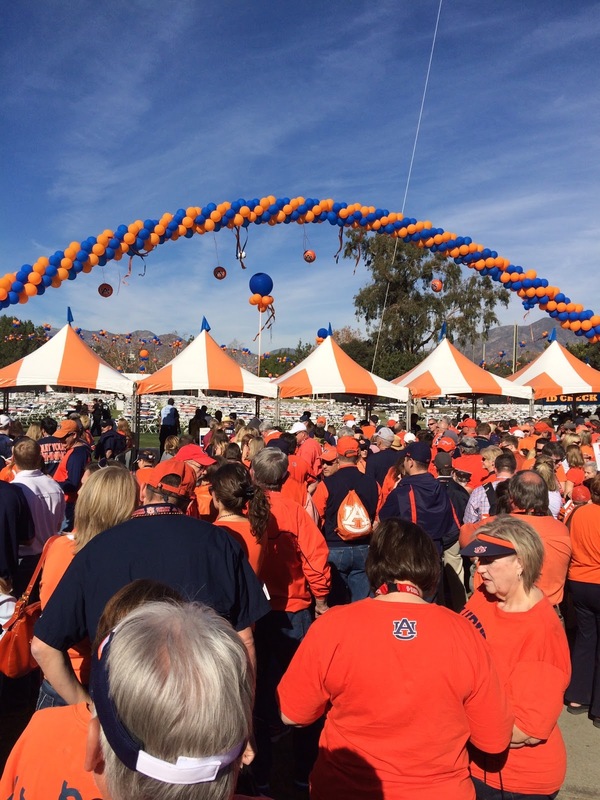 We spent the afternoon at the Auburn Alumni Tailgate. They had a buffet, beer, wine, water and drinks. There was a band playing the whole time. Overall, it was a great way to spend the afternoon. We spend the day after the game at Disneyland. I will share that with you next week. War Eagle!!!! 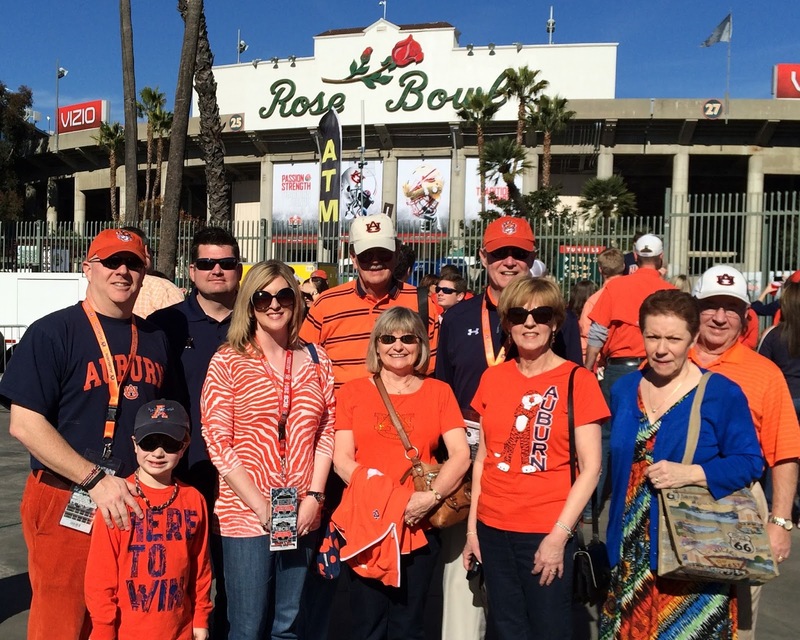 We went to Phoenix for the 2011 BCS National Championship Game, but didn't get to go to Pasadena. Thanks for taking us along through your photos!! 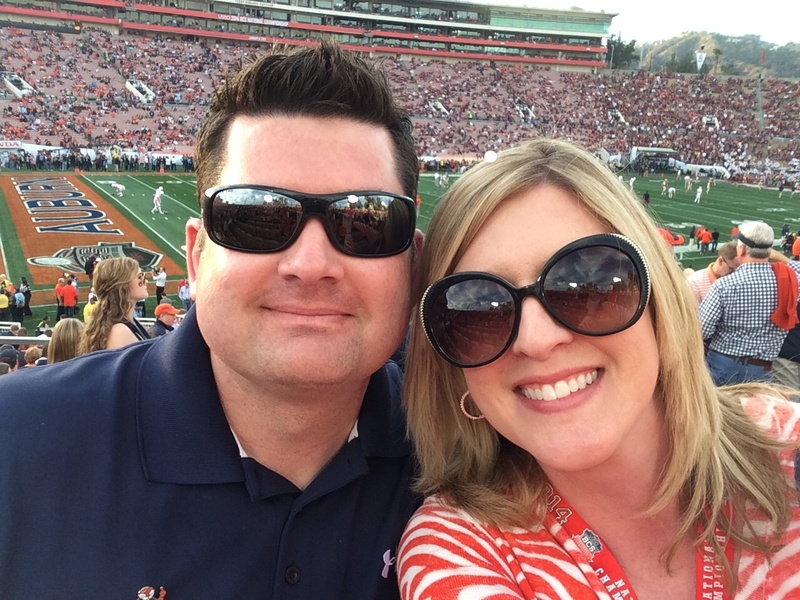 Again, War Eagle from Auburn!!!! We didn't go to Arizona, so we felt like we had to go this time. I am glad we did. Los Angeles is so much fun. We are already trying to decide when to go back. 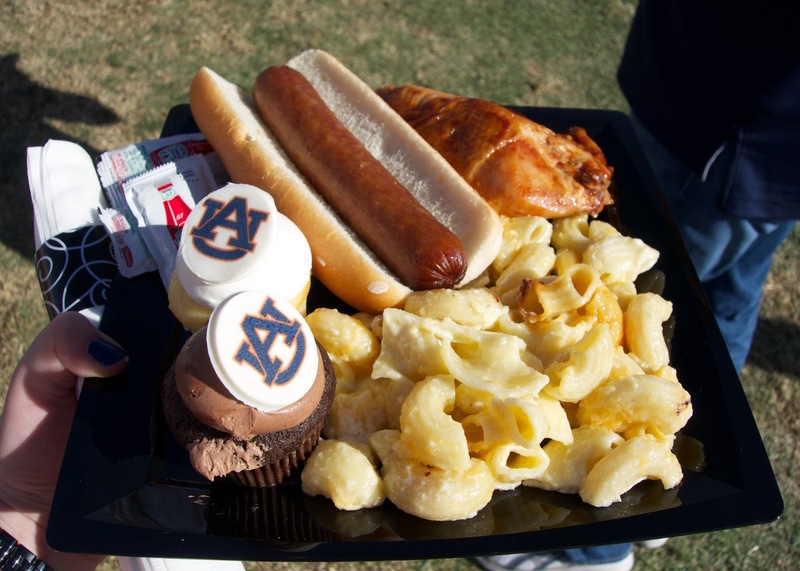 War Eagle! oh my gosh ahhh I LOVE all of the photos! 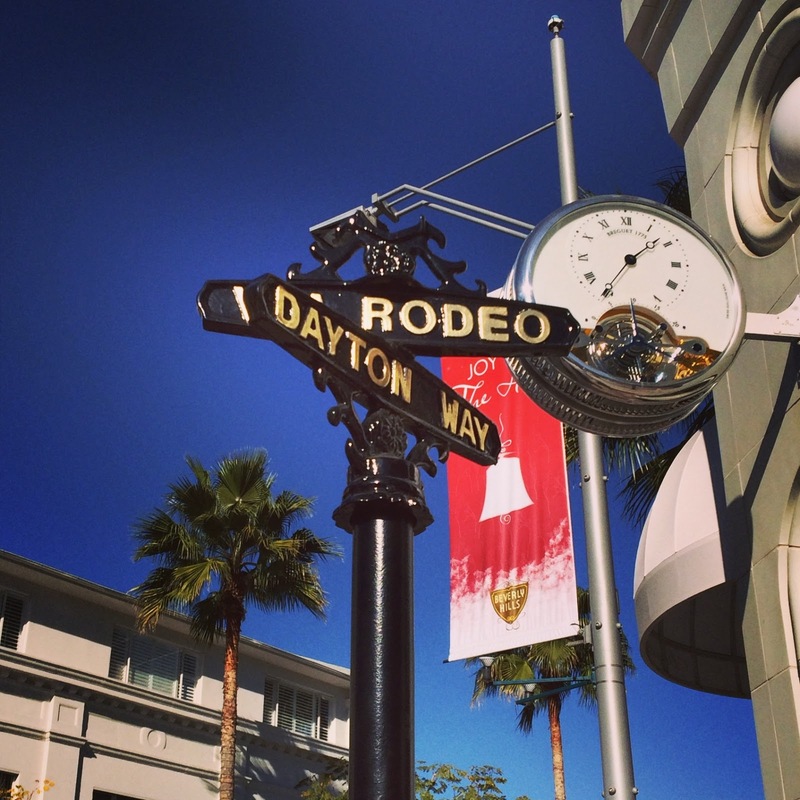 and I'm totally jealous of you getting to go to Rodeo Drive! But whoa, I thought it would have been bigger too! Warrrr Eaggggle!! 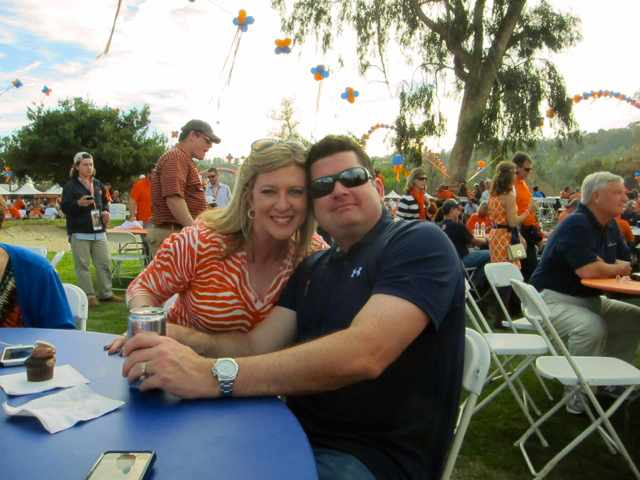 Thanks for sharing your pictures and BTW LOVE your orange and white Game Day shirt! Loved seeing your pictures! 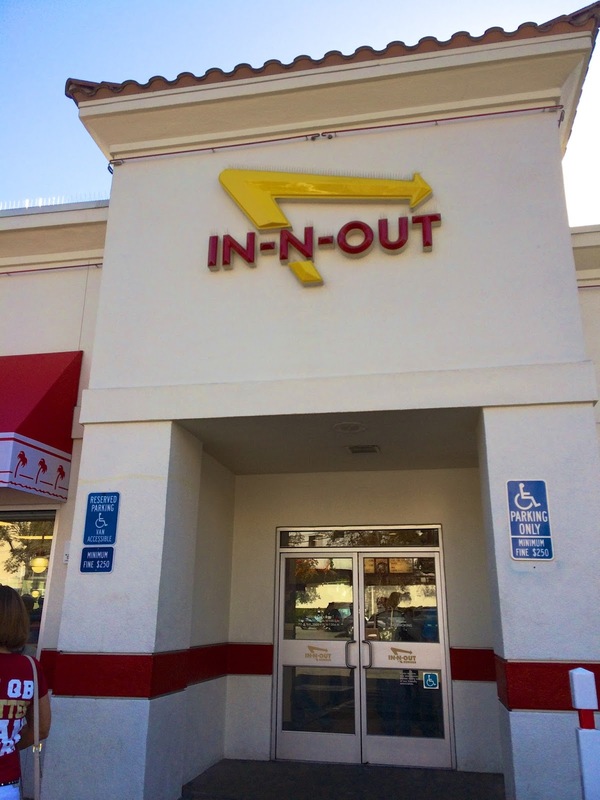 Always stop at In and Out when on the west coast even though we rarely eat "fast food" at home in NC. 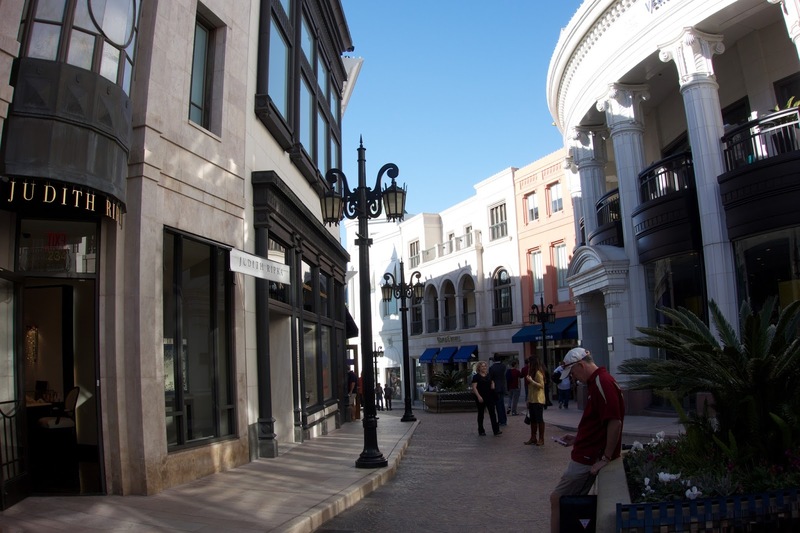 Did you purchase anything on Rodeo Dr.? I'm still kicking myself because I didn't. Looks like you guys made the most of your visit and had a grand time in spite of the game score - good for you. Glad the burger was worth the wait as the touristy places are often a let down - I could go for it or one of those good looking steaks. Don't do a plain old celebrity homes tour.... do the DEARLY DEPARTED tour! Much more interesting! I live here in So Cal and hubby and I have a blast being tourists in our own neighborhood. Loved your pics, glad you had fun! This looks like it was an incredible trip! 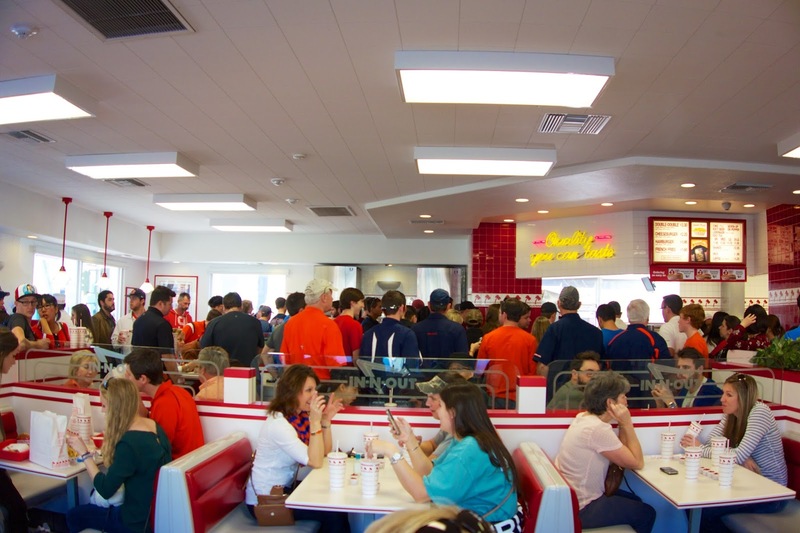 Thanks for letting me live vicariously through your trip to In and Out Burger...and beyond!